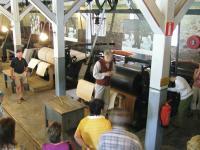 The Verla Groundwood and Board Mill is a well preserved 19th century mill village. It consists of a number of buildings in a rural setting, including the mill, board-drying plant, storehouses and the owner's residence. The mill produced mainly (paper)board for export to Russia, Europe and the USA. The first groundwood mill at Verla was founded in 1872 by Hugo Nauman but was destroyed by fire in 1876. A larger groundwood and board mill, founded in 1882 by Gottlieb Kreidl and Louis Haenel, continued to operate until 1964. 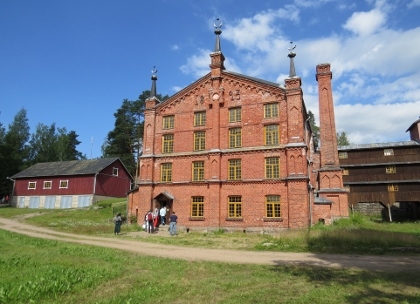 Wood-processing mills were common in the Nordic countries, but Verla represents the best-preserved example that remains from the 19th century. I kicked off my long weekend trip to Finland with a visit to the Verla Mill. I had stayed overnight near Heinola, already en route between Helsinki and Verla. I arrived in Verla around the opening hour at 9.30 am after an uneventful drive, and decided to have a look first at the rock paintings at the nearby lake. They apparently show a row of reindeer, but even using the largest zoom on my camera I couldn't make the scene out. 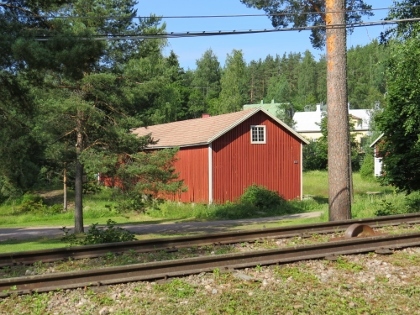 The old Verla settlement has a similar setting to the Engelsberg Ironworks in Sweden. A handful of wooden red buildings, scattered around. Nothing too special at first sight. Fortunately this time I could join a tour to the interior, something that should not be missed as it tells the story well. I had to share my tour with about 30 recent immigrants to Finland, who were learning Finnish and so the tour was conducted in that language only. I was provided with a leaflet in Dutch however that explained the main facts about the locations we visited. The tour starts with an impressive short film that shows the mill in operation (starring elderly employees, probably the film was shot at the last days of the factory's existence). Verla was a cardboard factory, and the whole elaborate process is shown. The horses, the men and the women all had their specific tasks. You're not allowed to take pictures inside, but John Booth (see photo beside his review below) has been naughty and caught a glimpse of what it looks like. 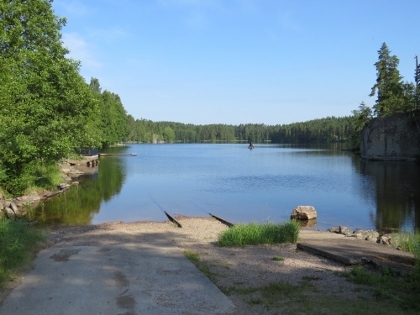 The site is quite popular with visitors, maybe because it is within driving distance from Helsinki. It has two souvenir shops and a café to cater to them. The guided tour costs 8 EUR, but you can roam around freely among the historic buildings. This was the second site we visited on our tour through Finland. Generally speaking I've quite enjoyed industrial Heritage sites like those in Germany and England, and I quite enjoyed this one as well. The large main mill building is excellently preserved, and is apparently much as it was when the factory shut down in the 1960s. The first stage of the mill tour involves watching a film that details the workflow of the mill, showing how the raw logs were eventually turned into cardboard and the like. It was quite cool to walk out of the presentation room into the factory proper, and see the exact same locations and machinery we'd just seen on the screen - a little jarring, but cool in its own small way. Around the mill itself there's also the large owners house which is quite impressive, along with several other outbuildings of the mill. We spent a bit of time wandering the grounds, though the highlight was definitely the mill building. The cafe in one of the buildings had some tasty local Finnish specialties which we hungrily devoured! My only real complaint with this site was that photos and videos weren't allowed inside! I'm really not sure why - there isn't delicate painting to be protected, no trade secrets, and it's definitely not crowded enough to be a crowd management issue either. Maybe they've had problems with people filming the tour guides? Either way, we found it strange and it made for a rather difficult video! Reaching Verla requires careful planning as there is a bus service from Kouvola twice on Tuesdays only. So I went on the morning bus, spent the day visiting the site which covers a large area on the bank of the Kymi River. A delicious buffet lunch is served in the refectory. And there are walks into the village and the surrounding birch forest. The river at one time formed the boundary between Sweden and Russia, and the remains of the old customs house can be seen. There are also some ancient rock engravings to be seen on a cliff overlooking the river. I returned to Kouvola on the afternoon bus. Verla is a rather small place in the forest. It's about 150 km to go from Finnish capital Helsingfors. 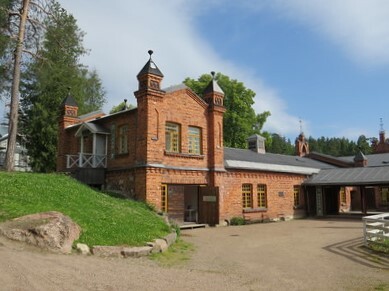 Verla is a very well restored mill. It is small scale and easy to understand. The surroundings are nice. If you are intersted in industry heritage, this is good. Minor problems are that there is no connection with the social situation for the workers like some houses where people lived, some church and other social arrangements. The exhibitions in other languages than finnish is poor but nice books can be bought. One thing that may seem peculiar today is that the works seems to have been runned the last 10 years 1955-64 without profit just to make a socially acceptable exit so that workers could retire. That is only 50 years ago but would be impossible in todays fast and unresponisble economy. Locations for playing sport: Bowling Alley, built at the end of the 19th century. 64 Community Members have visited.